RRP: £37.13 (+VAT). OVER 50% OFF! Slim jaw version of the Bahco 9029 wrench, with wider opening and thinner jaws than a standard adjustable. 4.5mm ultra slim jaws (with same jaw strength as the 9029). Ideal for working in tight spaces - 45% thinner jaws. 15° angled jaws provide maximum access in confined spaces. 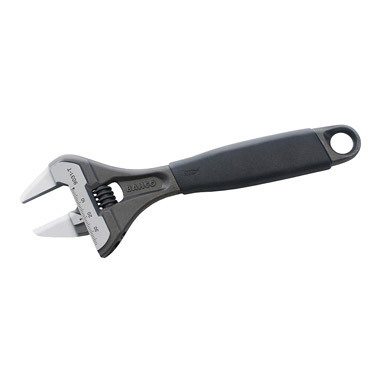 40% wider opening compared to standard adjustable wrenches. Finish: Phosphated, precision-hardened and anti-corrosion treated.